Turtle River Millwork is a full service custom millwork shop located in Mercer, WI, nestled in the heart of Wisconsin’s Northwoods. The custom woodworking shop specializes in handcrafted doors, cabinetry, and furniture. Owner and master woodworker David McNutt learned the craft from his father, who built homes in his spare time. “Dad was very self-sufficient. As a kid growing up we lived in four homes I helped on. He would build one, then start on a nicer one and make a profit selling the first,” says McNutt. “I was his laborer,” he adds with a grin. When he grew up, McNutt followed in the footsteps of his father, building his own home and later a cabin in the Mercer, WI area while working full time in the telecommunications industry. In 2004, he founded Turtle River Millwork’s parent company, the McNutt Group, doing small millwork projects and remodel jobs as a sort of corporate stress relief. 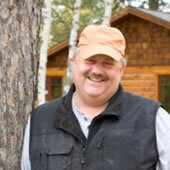 David McNutt started Turtle River Millwork in response to requests from customers of the other branch of his millwork business, Wooden Craft and Design, for unique wood projects. “We didn’t have a source for unique doors, so we started making them,” he explains. Word spread, and soon the demand for the company’s beautifully handcrafted rustic doors and other wood products increased to such a level that Turtle River Millwork became McNutt’s primary business. Turtle River Millwork is dedicated to creating the highest quality experience for its clients. From consultation to delivery, as much care is given to your vision and your expectation as to creating a unique and beautiful heirloom that you can enjoy with pride for years to come. Looking for a special wooden door or other rustic wood piece to complement your home, camp or cabin? For more information about our shop or to speak with a Turtle River Millwork design specialist, contact us here. At Turtle River Millwork, our goal is the customer’s goal. We want to fully understand your vision and then design and create the unique features and characteristics you want the setting to offer.